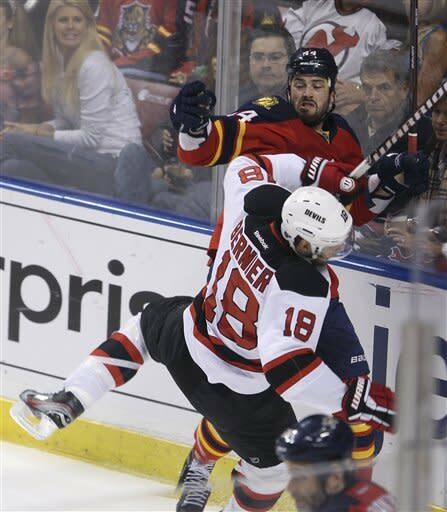 SUNRISE, Fla. (AP) Jose Theodore thought Adam Henrique was going high. The rookie went low. And with that, the New Jersey Devils went to the Eastern Conference semifinals. Henrique scored his second goal of the game at 3:47 of the second overtime to give the Devils a 3-2 victory over the Florida Panthers early Friday, sending New Jersey into a second-round series starting Sunday against the Philadelphia Flyers. He did a lot better than that. Theodore said afterward he didn't have a great look at the final shot. Just like that, the Devils were winners of a postseason series for the first time since 2007. And with the game ending in the early hours of April 27, it marked the 20th anniversary of Martin Brodeur's first postseason appearance in goal for New Jersey. Henrique doesn't remember Brodeur's debut. After all, he was only 2. But this night, that'll be unforgettable. ''Pretty cool, I guess,'' said Brodeur, who stopped 43 shots. Stephen Gionta also scored in regulation for New Jersey, which wasted a 2-0 lead in the third period. Stephen Weiss and Marcel Goc scored third-period goals for the Panthers, and Theodore made 33 saves. The Panthers made a surprising run to the Southeast Division title this season, earning their first postseason berth in 12 years. The Panthers thought they were on the board 1:50 into the third period when Mike Weaver's shot from the right point got past Brodeur. Shawn Matthias was whistled for goaltender interference, nullifying the goal - and further firing up the already desperate Panthers. Weiss cut the lead in half at 5:02 of the third, burying a one-timer from the right circle after a pass from Brian Campbell. The equalizer nearly came 3 minutes later, when Weiss had another shot blocked, Scottie Upshall nearly got his stick on the rebound - the Devils' Andy Greene tied him up just enough to thwart that chance - and Kris Versteeg's try was batted away. Didn't matter. The Panthers kept coming, getting the franchise's biggest goal in 16 years. Shawn Bergenheim made a nifty move to get free for a shot that Brodeur stopped. The rebound rolled left, nearly on the goal line, and Goc knocked it home from an extremely tough angle to tie it at 2 with 3:28 left. And to overtime they went. The Devils and Panthers played 11 games this season. 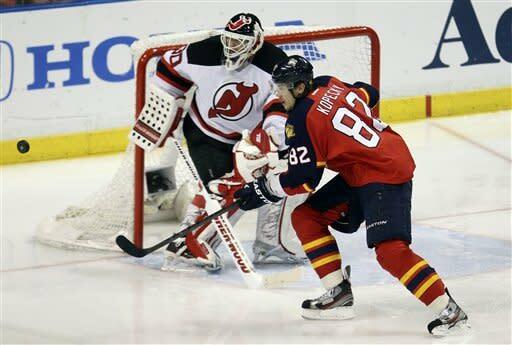 New Jersey won six, Florida won five, and the Devils outscored the Panthers 29-28. As close as could be, all the way to the end. The first 2 minutes of regulation - probably long forgotten by the time the game ended - went about as badly as could be for Florida, which quickly found itself down both a goal and a center. Henrique opened the scoring when he tipped the puck past Theodore to get New Jersey on the board and silence an anxious crowd. Anton Volchenkov camped out at the left point, waited for a pass from behind the net to bounce off the boards and carom his way, then fired a one-timer that Henrique - considered by many to be the league's best rookie - directed into the net. A half-minute later, things got worse for Florida. Panthers center John Madden and winger Tomas Kopecky collided near center ice, and Madden took the brunt of the big hit. He writhed in agony for several seconds before trying to crawl to the Florida bench, the blood pouring from his face leaving a blotchy red trail along the ice. Two workers emerged to scrape up the mess. New Jersey dominated the opening minutes, taking eight of the first 10 shots. Eventually, the Panthers settled down - getting 10 shots on Brodeur in the final 10-plus minutes of the first period, yet still heading into the first intermission trailing 1-0. Lucky or not, it was enough to get the Devils going. And fittingly, Henrique not only got his team started, but then he finished the job. NOTES: The Devils and Flyers split six meetings this season. It'll be the fifth time in the Brodeur era that the teams have met in the playoffs; Philadelphia won in 2004 and 2010, while New Jersey prevailed on their way to Cup titles in 1995 and 2000. ... Florida had as many broken sticks - two - as shots in the second period. ... Madden returned to the ice about 13 minutes after needing to leave following his collision with Kopecky.